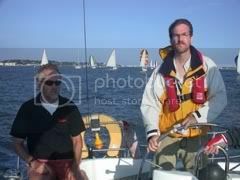 I've just completed the five day RYA Competent Crew sailing course with Five Star Sailing based in Warsash, Southampton. 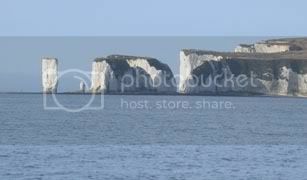 We mostly sailed in the Solent which is the channel between the UK mainland and the Isle of Wight but we ranged as far as Poole and Chichester. The course is the first step in the RYA Sail Cruising scheme. It's a practical introduction to sailing with the goal of making you a useful crew member. My real goal in taking this course was to decide whether I'd like to attempt taking the family on a sailing holiday some time in the future. I'm now convinced it would be a lot of fun though I haven't figured out exactly how I'm going to attempt it. Anyway, this is how the course went. So I got down to the school early and after a little waiting, I was greeted and invited to load my stuff on the boat. I was very pleasantly suprised when I got to the the yacht. 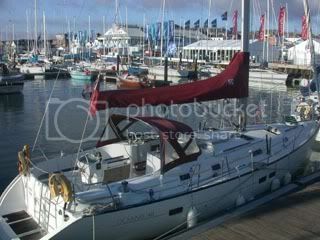 It was a lovely Beneteau Oceanis Clipper 411. I also met my two fellow students, Gerhardt and Bruno, both Germans somewhere in their thirties who were also loading up. Normally the course is run with five students so it was fantastic that there were only three of us. The other fellow's were doing the Day Skipper course at the same time I was doing the Competent Crew course. We soon met Paul, our skipper, and started getting briefed and settled. We had to draw match sticks to decide who got the worse cabin and yours truly lost. I was stuck with a tiny cabin with bunk beds that seemed like large bookshelves. Honestly, I was a bit dubious about how I was going to sleep. We then headed to the pub for dinner but drinking was out of the question since the plan was to set sail that night for Cowes on the Isle of Wight. Sailing itineraries revolve around tides and this was our first taste of it. Either we left that night or we wouldn't be able to get out until late the next morning. It's also part of the Competent Crew syllabus for me to get a taste of night sailing. It was a gorgeous crossing with a full moon hanging low in a starry sky and a warm breeze sending us on our way. Brilliant. I manned the helm for the whole crossing. It was also rather hairy watching out for all the signalling buoys and directions of other vessels. It basically proved the point that night sailing is an advanced skill not to be taken on lightly. We moored at Cowes and congratulated ourselves on our first sail. It was 1 am by then so I wriggled into my cabin and slid onto my bookshelf. It felt like sleeping in a coffin. After such a late night, we were in no rush the following morning but it didn't take long to get out into the Solent and start learning. We were blessed with a sunny afternoon and a good breeze. Basically, Gehardt and Bruno took turns being the skipper which was primarily about navigation while I was the crew. I literally learned the ropes that day. I also learned that sailing isn't necessarily relaxing and can be a lot of work! One of the key things we learned that day and practiced every day afterwards were "man overboard drills". This was primarily part of the Day Skipper syllabus. Picking up the fender is simple but a real person could be very difficult. They would probably need to be winched aboard with the spinnaker sheet. Falling overboard in a rough cold sea is serious enough that you should send out a May Day on the VHF if it happens. We moored in Yarmouth against a harbour wall right where people wait to board the ferry. It's a tiny place but it had a pub and great shower facilities. Great facilities is a real consideration with sailing since you really don't want to use the onboard shower. It rained that night and we had a soggy grey start in the morning. The yacht was fully provisioned with food and we had a menu that we were supposed to stick to. Everyone shared in the cooking and cleaning and that includes preparing hot drinks and lunch while under full sail. I had my first turn at frying bacon and making tea at precarious angles that day. It's all part and parcel of learning to sail. After a short break in Lymington Harbour, we sailed down to Poole. The wind picked up and it turned sunny for some exciting sailing. I had the yacht heeling hard over doing 8 knots and careening through some waves. Superb! I love that feeling of a bucking yacht blown over by the wind. It's hard work manning the helm and keeping the sails full. Poole harbour was busy so we moored along a raft of power boats. To get to the shore you step from boat to boat going across their bows. It makes for a great social lifestyle as you soon meet the neighbours. The quay itself was lively with a huge gathering of motorcyclists. Since harbours are generally near the center of towns, you're immediately in the heart of any hustle and bustle. Paul and I settled in a pub for a drink. Woke up in the middle of the night feeling like I was suffocating in a coffin. Got some more air into the room and went back to bed. I'm not claustraphobic but it takes a little getting used to. Because of the tides, we had a very early start. We slipped our mooring lines by 6:45am and motored onto a calm sea on a beautiful sunny morning. Unfortunately, we had very little wind the entire day. We used the engines to get us back to the Solent where we had a spell of cloudy and cooler weather before getting sunny again outside of Yarmouth. It was rather boring being a motor boat that day. I found helming the yacht gets quite mesmerising as your gaze is fixed on the horizon and you're gently rocked by the waves. Gerhardt managed to catch a mackerel by trawling a fishing line. At lunch, my fellow students went for a swim - too cold for me! At least the lack of wind gave my hands a break that day. They were both aching and tired from the previous two days of sailing. That afternoon I got to helm the yacht during a man over board exercise and didn't do too badly. We then headed into Portsmouth to moor. This part of the Solent in incredibly busy with ferries, ocean liners, cargo ships, hovercraft, speedboats and other vessels of all shapes and sizes. It's definitely a good place to learn about rights of way. 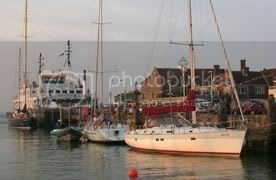 The marina at Portmouth was fantastic with a large floating lightship converted to a pub with superb shower facilities. That evening we took Paul out for dinner at a nice Italian place. He was a happy with our abilities and we had covered all the course material. Cowes was getting fully decked out for the Cowes Regatta starting on Saturday. This is the largest and oldest regatta in the world. That evening there was a live band playing classic rock and a large beer tent so we took turns buying rounds and got quite tanked. Another nice day with a good wind. It's only a short distance from Cowes back to Warsash so the day was just spent playing around in the Solent tacking and gybing as we wanted. Gerhardt caught another mackeral so we had sashimi for lunch. It was a nice end to the course. We finally moored, cleaned up the yacht and were presented with our certificates.